Y'all know now that I'm all for my brows, if I could elongate them and make them thicker I would but I should be grateful for what I have and work with them. I honestly don't do my brows as often as I should(?) I don't mind the odd grow out here and there but then they start to loose their shape and I end up with a new shape to deal with, oh the brow struggle. If there is one thing I do suffer with it's ingrown hairs! Yes flipping ingrown hairs, not my most favourite things ever and I always get them by my brow bone. Shavata Precision Pointed Tweezers - these have become a lifesaver. Due to them being thinner, it's more accurate for me to get under the hair when it's raised from the skin. It'll take me a few days but to get the hair from under the skin I'll place a warm cloth on the brow and leave it for a few minutes afterwards I'll make a mixture of two crushed asprin's and 1tsp water, mix it and apply it to the area where the ingrown hair is. Do that daily until the hair is loosened and I can take the tweezer and carefully go under the hair and able to lift it up and out. These are also good for getting a nice, accurate arch shape. I've noticed they are very sharp, to the point that they can cut your brow hair before you even pluck it out, so be careful! Scissors - I vary from unkempt to trimmed sharp brows. 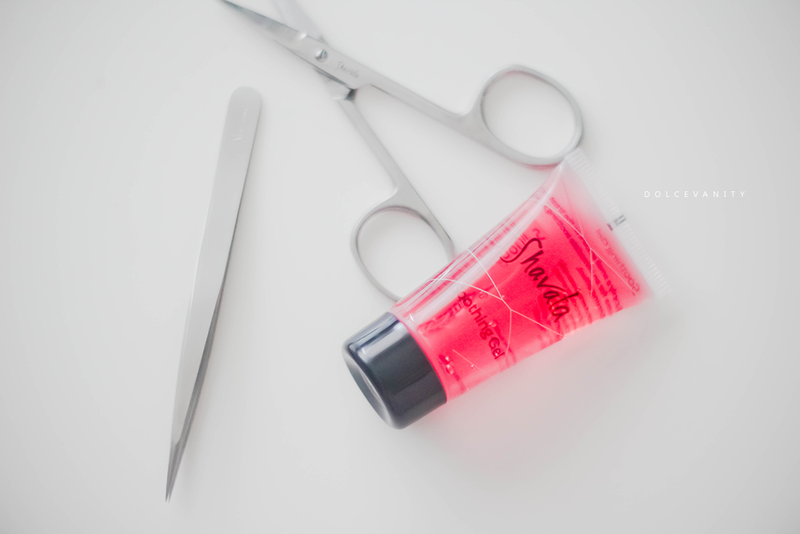 Shavata scissors are small and give more control with trimming the brows. I brush mine upwards and see if there's any hairs that are longer and snip away. Very handy and small enough to slip into a make-up bag. I keep them in the plastic bag they came in to keep clean. Aftercare Gel - Always needed, if you're removing hair on that face of yours, make sure you help it to heal and soothe any soreness that can occur. I always get irritated skin on my forehead after removing hair and this mixture of aloe and arnica helps cool & fade any redness. In fairness you could probably just use any type of aftercare gel or pure aloe vera if you have a plant. Do you do your brows yourself or do you get someone professionally to do them for you?